An unconventional, and daring call for self-love and acceptance. What is it like to love yourself without reservations under a system that wants you dead? This is the question Baltimore artist Abdu Ali explores on their new single, "Chastity," premiering today on The FADER along with a Whitney Mallett-directed video. The track comes off their forthcoming album, FIYAH!! !, due in April. Peering at the question with grace and love, "Chastity" focuses on the push and pulls of divine self-acceptance, and the traumatic losses that had to happen to reach that point. "Way back I wanted to be clean, but now I see that being dirty is the way to be," Ali raps on the initial moments of the song, "Free. Free. Free." 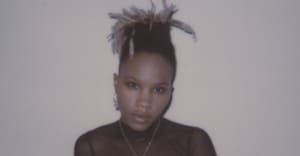 The track pulses via an experimental blend of jazz, electronic, and 808s, which Ali labels as "post-futuristic." For me, it brought to mind something else about freedom: that oftentimes it leads to profound creation, and transformation.